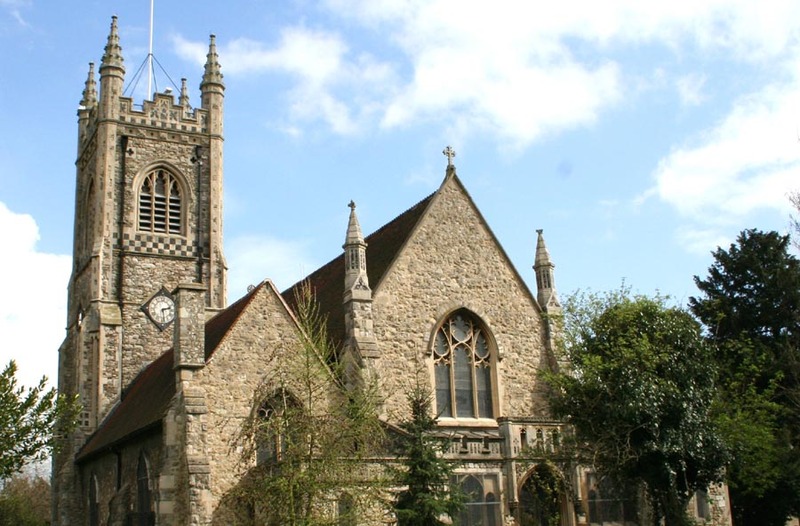 St Margarets is one of Thurrock's Grade 1 listed churches. It stands on rising ground in the centre of the village. The walls are constructed mainly of ragstone rubble with some flint, with dressings of Reigate limestone. The present church seems to date from c.1180. This late Norman building was soon enlarged by adding a south aisle and chantry chapel, followed by a north aisle in c.1280. About 60 years later the south aisle was remodelled and the chancel extended eastwards. The original rather low tower was probably of this period also. The south porch dates from the 16th century, with modern alterations; the nail studded door is 400 years old. The two hatchments hanging in the nave were restored in 1974 by K.R. Mabbit of Colchester. In the wall north of the chancel arch can be seen a square headed doorway of c.1450, which once gave access to the rood-loft. The font of Purbeck marble dates from c.1210, with later restoration, and a Stuart cover. The north chapel probably originated in the 13th century, but has been much altered. It is dedicated to St Nicholas and St Mary, as a perpetuation of the two chantry chapels that once existed in the parish. There are a number of interesting plaques on the walls. The blocked north doorway in the north aisle frames a monument to Sir Richard Champion. There is a tablet on the east wall to his nephew Richard Champion who died in 1599. The south aisle was built about 1340, the three windows along the south wall being added later. East of the south doorway is a holy water stoup with semi-octagonal bowl of c.1400. On the south wall, just outside the chapel, is a wall tablet to Thomas Fetherston and his wife Elizabeth. The south chapel was rebuilt in the 15th century. It is generally known as the Scratton Chapel, although it contains rather more monuments to the Fetherston family. Beautiful carving enriches the medieval screen round the chapel where the Fetherston family sat apart at worship and were laid to rest. A large slab in the centre of the floor lists the Scrattons buried in the vault below. The archway between the south chapel and the chancel, mostly occupied by the organ, dates from about 1340, the great window being mainly of late 19th century reconstruction. The organ was installed in 1901 at a cost of £550. In the early 19th century the church fell into disrepair; the north aisle was used as the village school and the rest of the building was said to be used as a dump for the rubbish of the parish. The church was described in 1872 by William Palin, rector of Stifford as in a miserable state of dilapidation and decay. The whole building was restored in 1877-78 at a cost of more than £3,000, of which about £1,000 was contributed by the rector. This work included the renewal of the nave and chancel roofs, re-flooring the nave and aisles and the erection of five new stained windows. In 1883 the vestries at the west end were added and the new tower was built in 15th century style. Behind the vestries is one of the extravagant tombs of the 18th century, carved all over with flowers and cherubs in memory of James Adams. The five original bells were recast in 1883, when a further bell was added. They were again recast and rehung in 1939 by John Taylor of Loughborough, with the addition of two more. Stanford-le-Hope, a History of the Church and Village, by Aubrey Saunders. Kellys Directory of Essex 1895.